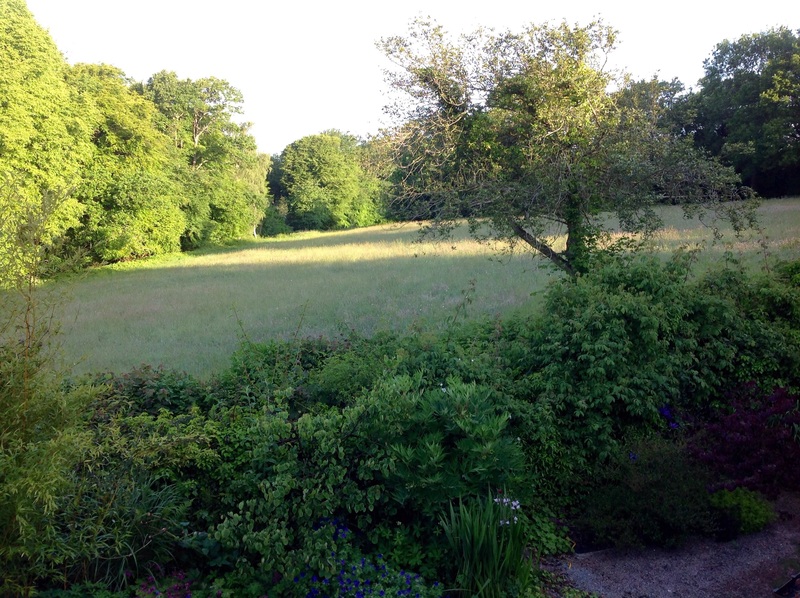 For the last few months we’ve been circling the new stylised meadow, squinting at it from different angles whilst trying to imagine what focal feature would work in the centre of the access path. The planting of seed raised Deschampsia cespitosa and Molinia caerulea subsp.arundinacea has a wild look about it, echoing the tustled look of the adjacent hay meadow. 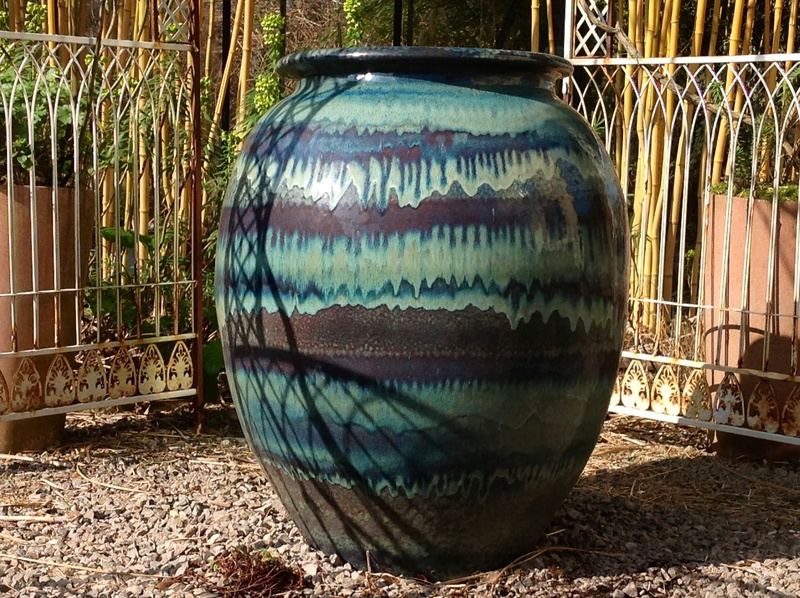 It’s also evocative of where I found my favourite garden ornament : a Thai klong jar. In South East Asia, klong jars are traditionally used to collect and store water for household use, much in the same way that we gardeners use water butts. In Brockweir, where we live, there was no mains water until the 1950s. We know from local residents that water was harvested from neighbouring wells and streams, then stored in underground tanks. The disused tanks are marked on Ordanance Survey Maps, however, a few, lurking in the beech woodland across the fields behind Barn House, are dangerously uncovered. Recently, Bob, a friend’s black lab strayed onto private land and had to be rescued from one such tank by his intrepid owner. Klong jars can still be seen in use throughout the Far East, although these days they tend to be made out of plastic. Traditional ceramic or earthenware jars share the same simple shape, wider in the middle than the top with a curving lip. In Margaret Macmillnan’s fascinating social history ‘Women of The Raj” (Random House Trade 2007) she recounts the trials faced by a newly married wife, a successful member of the autumnal ‘fishing fleet’ of single women that sailed to India in the hopes of catching a husband. Faced with the dilemma of how to ‘bathe’ in a bathless bathroom, the new arrival mistakenly clambered into the water storage jar only to find it home to the house snake. In her panic, she found herself pinned in the jar by its tapering shape. The naive memshab was rescued, much to her mortification, by a manservant. Perhaps, at that precise moment she rued that she’d not been one of the ‘returned empties’, those whose shame it was to sail home still single the following spring? Antique jars, usually of the wonderfully weathered salt-glazed sort are highly prized, accordingly, they command a high value. We’ve drooled over many such a jar in our time. Equally, the modern reproductions, some with exquisite glazes in a range of delectable colours, are quite sought after too. Some turn up as decorative features in hotel lobbies across Asia, others, no doubt, are scooped up by western interior designers. The jar we came home with had far less salubrious beginnings and for the last three years has been the home of the resplendent ‘extra large’ Hosta ‘The Prince of Wales’. This year ‘HRH’, as we fondly call him had inevitably outgrown his quarters and was divided back in March. It was a delicate operation for both the plant and the pot. I couldn’t help but be reminded of the plight of the poor memshab …. One very nice, and otherwise accurate journalist reported that we hunted for plants in Asia. That made me laugh. We hunted for pots and brought home lots of them. But they weren’t the sort with fancy price tags, we found them in a dusty factory outlet on the outskirts of Kanchanaburi. The luckiest find was abandoned along with other cast-offs in an area of tall snake-ridden grass. Only the shoulders and rim of the pot were visible. Never mind plant hunting off-piste in the wilderness, I wasn’t venturing beyond the path, especially in my silly sandals. The pot was bought, pretty much sight unseen. When it was delivered later that week, we gasped : it was a beauty. 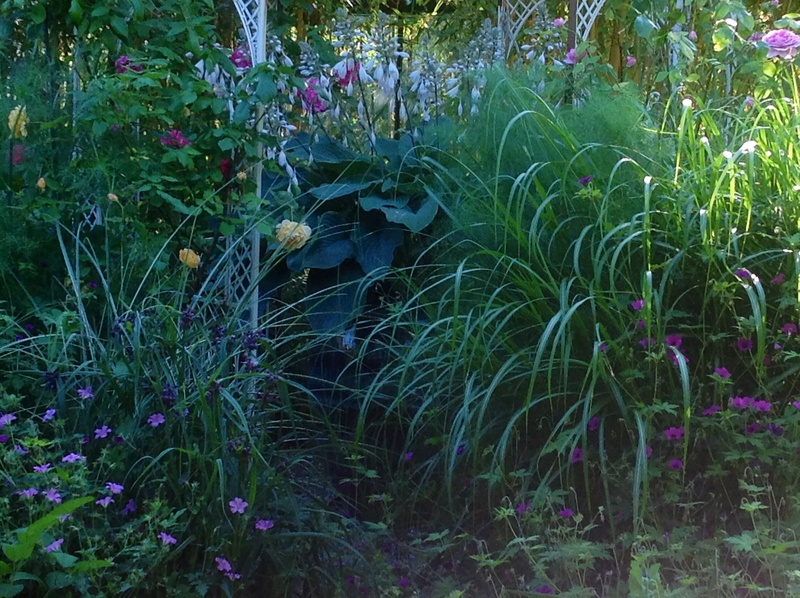 The jar, now hiding in the summer planting, was regarded as a complete reject. Imperfections in its celadon glaze caused by the secondary firing to produce the characteristic crackled finish had, as often happens, pitted the surface of the underlying material. Plus, and probably the deciding factor in the manufacturer’s mind, hairline cracks crazed the inner skin of the jar. Although it wouldn’t hold water, it makes a happy home for a handsome hosta. Diana Grenfell’s marvellous and definitive “The New Encyclopedia of Hostas” (Timber Press 2009) suggests lots of hostas that would compliment our beloved pot, many of a more appropriate size, but, while we have the derring-do to excavate it very few years, we’re sentimentally attached to the pairing. Personally, I love the big blue pot all the more for its imperfections, particularly the tactile pitting. I think it gives it character. Without its flaws there’d be no story to tell. And, without it, we wouldn’t have gone hunting in a local garden centres for a second such jar to recreate a scene that reminds me of the day I spied a big blue pot in an oriental meadow. A wonderful story. I love your beautiful pot and your fascinating story of how you found it. Your grass meadow is lovely . Will you have to cut it down in the Spring? Thank you, Liz. 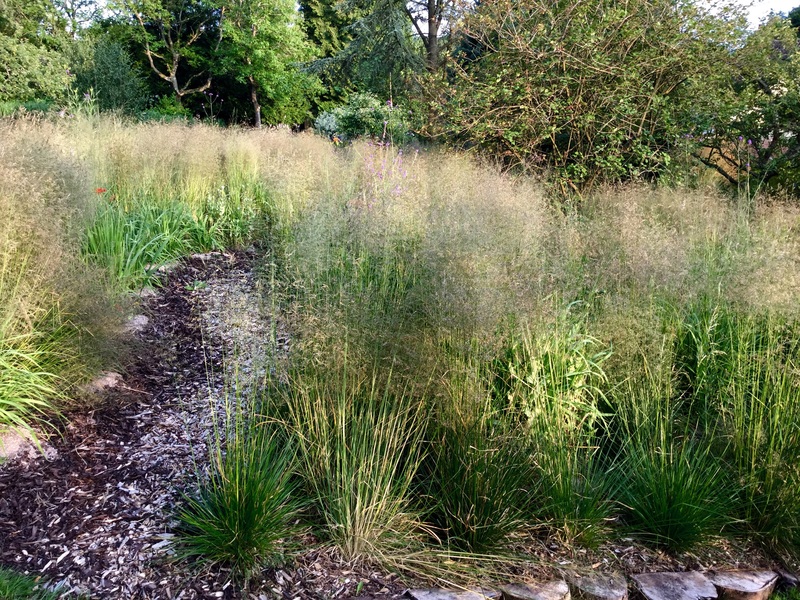 The deschampsia looks good throughout the winter, so it gets cut back in spring. 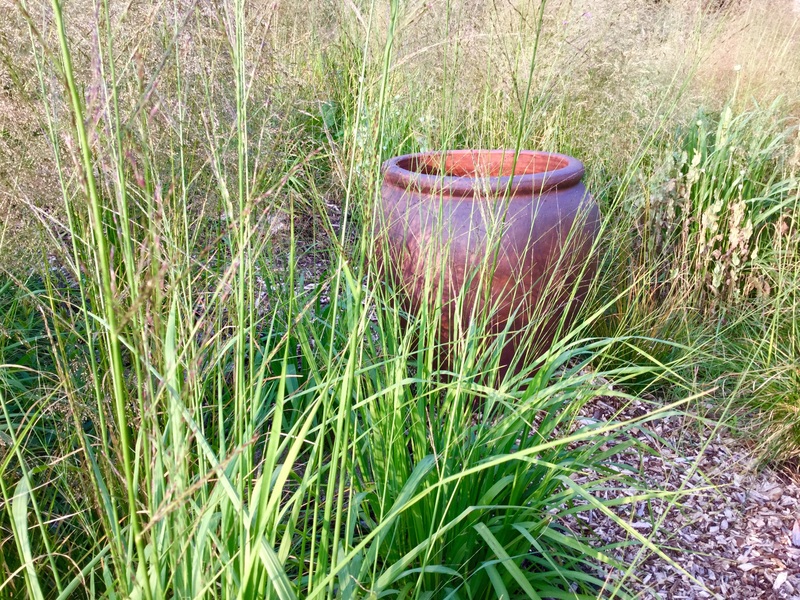 The molinia is lovely with buttery foliage and gold flowering stems that last right through to December – it more or less looks after itself as it melts into a mulch following frosts. Love the story, and your pots! Thanks. I think you can never have too many pots! It was a very lucky find. I grow seven cultivars of molinia in the garden here in very different conditions on clay soil. Which ones have you tried? Several of them seem happy enough even in dry shade in the drip line of a mature blue cedar. Getting them established in dry spells can be tricky. 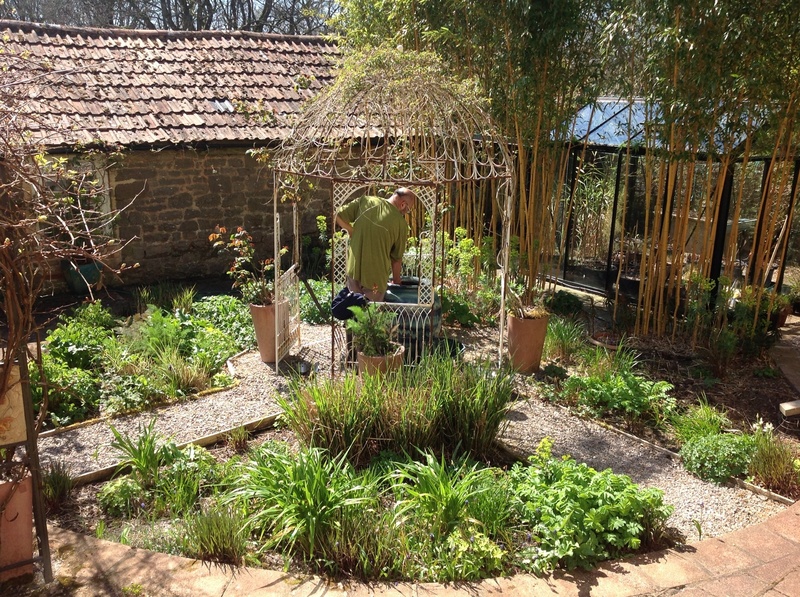 I have struggled a bit watering the new ‘meadow’ this year, planting in late winter, followed by a very dry spring was trying but recently we’ve had a good amount of rain. Hooray! That is a stunning pot and happy ‘find’ story. Is your ground quite damp for the Molinia? I’ve not had success with it here. Many thanks for leaving a comment on my blog. I will now get myself a coffee and find all about your lovely garden. Love your big pot, super colours! Thanks, Pauline, and your blog is a pleasure to read.